If media teams are frustrated because they aspire to test custom creatives across different market segments but can’t, creative teams are also frustrated because of the burden of work and unreasonable deadlines these kinds of requests can create. Services are priced accordingly. For a creative agency to produce a set of Flash banners might cost $10-20k. These costs typically come as a percentage of the overall campaign budget—frequently 5-15%. That imposes some hard limits on how much creative work can be done. Beyond the initial build, even generating variations on a creative idea is priced high enough that it’s not worth it to A/B test or try out riskier concepts. Alternate copy or ideas have to be left on the drawing board. Similarly, revisions to the creative once it has completed, no matter how trivial, are priced out. The entire process takes weeks or more to be completed. It’s not the designer’s fault that the entire creative process is slow, over-priced and inaccessible. The complexity of having a skilled designer work in Flash or HTML5 on a multi-format campaign warrant a twenty grand price tag. Not to mention that re-working the same creative across a bunch of different ad sizes and formats can get tedious and soul crushing. But it’s also not the marketer’s or media team’s fault for requesting those banners because they want to test or customize ad creative. So—in a world where marketers everywhere are able to run complex search, social and email campaigns without too much trouble—the display advertising process is surprisingly but reasonably full of friction. The blocker is the difficulty in creating the ads. And because of that, very little personalization or optimization exists on the design side. 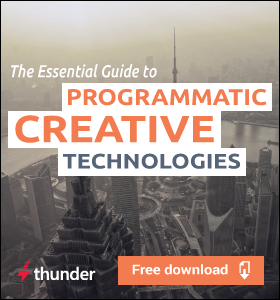 Programmatic optimization is all about leveraging media more effectively, with the creative conveniently pushed aside. If non-designers could own more of the process they would—just like they do in email, search and social. But doing that requires both creative and technical skills. At PaperG, we believe there is a better way to approach the design process. One that benefits not just marketers, but designers too. And it’s technology that is going to unblock us. 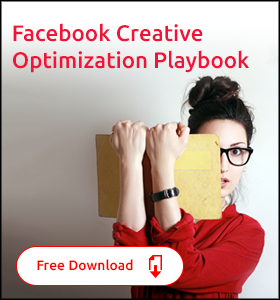 I’d like to give you a peek into a world where anyone can create beautiful, cross-platform ads in minutes. This is a world where anyone who needs to create or manage a display campaign is empowered to do so. That means if your campaign needs brand managers, media buyers, ad ops, salespeople, or account managers to be able to touch the creative, you can invite them. What would happen if the technical and design barriers were broken down? Think about it. If there a way to remove friction between teams, everyone benefits. Designers are pleased because when they can hand off design templates to other teams for lasting and repeated use, they are free to move on to higher value projects. Marketing is excited to personalize display creative for different segments and A/B test messaging, just like they do for almost every other channel. 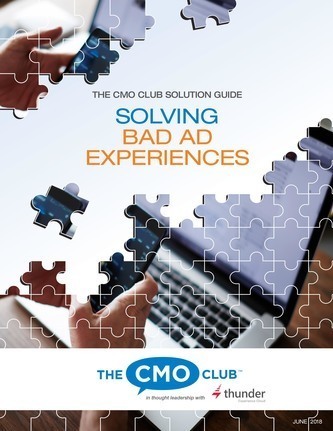 Ad Ops doesn’t have to delay the because the creative is delivered late by the agency. Campaigns launch on time, so Finance is happy because the campaign doesn’t under deliver if it was trafficked late. Sales can close more deals because generating a custom spec ad for each pitch is no longer an issue. And ultimately the customer or brand wins, because because the creatives aren’t stale and generic. The full potential of the creative concept was brought to life. 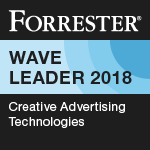 The democratization of design isn’t a marginal gain in efficiency—it’s an order of magnitude of difference—one that affects nearly every team in the display advertising ecosystem. When the design cost of optimization becomes negligible, media planners and their teams can customize creative to the segments they’ve put so much expertise into creating. Performance marketing is no longer just about the media. The ad creative becomes equally as important—which is the way it should have been all along. Any marketing concept where the speed or volume of ad creation was previously a barrier is now open. Oh, and there are plenty of reasons to vary the ad creative. So let me ask you, how could the same ad creative possibly ever be equally meaningful to everyone who encounters it? I’ll admit to asking a rhetorical question, because it can’t. But don’t worry. Creative customization isn’t out of bounds anymore. Our approach to solving the creative production problem was to think of ads as having two parts: 1) the design, 2) the content. The ad design controls the look, feel and layout of the ad. Think of this kind of like an email template—it’s branded and beautiful, but you don’t have to be a designer to use it. The content refers to the actual text or images within the ad. PaperG allows designers to create elegant campaign templates within a creative management platform. Each template includes ads of multiple sizes that share some elements—like text and images—which sync across all the different sizes. Templates offer the ability to “lock” assets, which is a way designers can provide access to parts of the creative to non-designers. We sometimes call locking assets “creating beautiful guard rails” because they provide a way to give other people just the right amount of access to the design. From there, building ads is as simple as clicking on parts of the ad entering the text or uploading the image. You can also store and select from a library of previously-uploaded content. As new elements are added, some of the design work is done programmatically, which is to say, some of the manual and repetitive work is taken care of for you automatically. You can build multiple ads at once since edits to text or images can be shared across the entire campaign. Text resizes itself to fit within the bounding box. An algorithm automatically crops and positions your photo for you within a masked off area. Another algorithm detects faces, and tries to make sure other objects in the design aren’t in front of them. Of course, you can always position the image yourself if the robots didn’t get it quite right. But the idea is to predict routine design tasks and do those for you, leaving you to focus on the “creative” part of the creative. If you don’t want to be constrained by templates or locked out of complex modifications, a full-featured, more conventional design experience is waiting for you in the Advanced Editor. This has all the tools you would expect to be able to arrange, align, and animate the various parts of the ad. 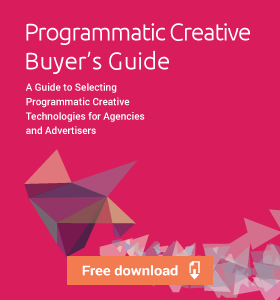 But our hope is that programmatic creative allows you to not have to go in there all that all too often. The whole process is so fast that preparing multiple versions of an ad for an A/B test takes seconds. Creating variants with messaging specific to various segments takes minutes. And once the templates are in place, it’s something that doesn’t necessarily require continually interrupting a designer to make changes. Is a Creative Management Platform Right For You? If you’re a brand or agency looking to scale your creative operation by unblocking your teams, let’s talk. If you’re a publisher looking for a smarter way to build directly sold display inventory, we’ve got something that you really should see. Contact us to learn more about what PaperG can do you for your creative process.